We arrived by overnight train, and discovered more to Xian a great little corner of China than just those Terra Cotta Warriors. Let our discoveries give you ideas for your visit to Xian. ...and our guide took us there first thing. And the cafeteria... because you will spend several hours exploring and savoring this whole attraction. It's amazing to see how the soldiers in the army were jumbled together and to think about how much more is still hidden underground. More excavation will wait until the scientists have developed better techniques for preserving colors. 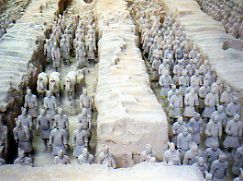 We had wanted to see this terracotta army for years, and they were just as impressive as we imagined. The surprise was everything else we found to enjoy in Xian. At the cafeteria for the Terracotta Army we watched the chefs preparing different kinds of noodles. The main crop around Xian is wheat.... so the basis for the meals is noodles and dumplings rather than rice. 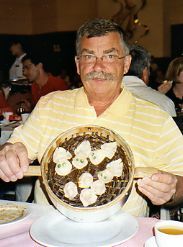 It's fascinating to watch the chef pull wheat dough again and again until he ends up with thin noodles... or watch his partner wield a sharp knife at apparently supersonic speed to send wedge shaped noodles flying into a boiling pot. You have to have one of each.... they are all wonderful, but I have to admit, you feel like a dumpling yourself when you're done. 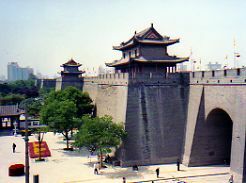 Xian has the most complete city wall in China. Our guide took us to the top of one of the entrance gates to see how high and wide the walls were. This wasn't enough for us... that wall stretched into the distance and around the corner and we just had to know what was there. With some free time the next morning we rented bikes and rode the whole 12 km around the city walls.... music lured us to peek over the edge to see people doing Tai Chi and ball room dancing. We peered into markets and saw side streets of residential areas. Getting close to see the colors on the trim of the watchtowers and gate houses. In the courtyard of one gate house, there was as exhibit of drums, and there were historical photos. This biking overview gave us a great perspective.... Xian A Great Little Corner of China? From the wall it was. And we would definitely recommend a bike ride around the whole wall. For those of you who might not want that much exercise, there are motorized tours that would be interesting. We visited both towers. Besides THE bell, there were many bells in the Bell Tower and many drums in the Drum Tower, but there were also exhibits, and history to read, and photos. And to top it all off, at the end of the day we enjoyed a drum concert in the Drum Tower just before dinner. Take a little time and explore the landmarks in a city. It makes your trip so much richer than just driving by. We also found time to explore the Muslim Quarter and visit the Great Mosque which was done (surprise!) in a Chinese style and totally different from any other mosque we had ever seen. The jumble of the bazaar was exciting, but the gardens of the mosque provided a quiet spot. After some quiet time in the Mosque garden, we felt every bit as relaxed as if we had just rested in our hotel room, but we saw and learned so much more. 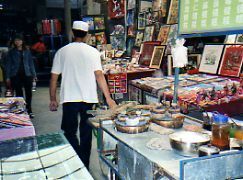 This was a whole little culture within a culture and another reason we found Xian a great little corner of China. The last afternoon of our visit, we rejoined our guide to visit the Little Goose Pagoda and the Big Goose Pagoda. The Little Wild Goose Pagoda wasn't on our tour, and we wouldn't have seen it but we insisted. Our guide kept saying there was nothing there to see. When a guide tells you this, they may be right, but if you really want to see something on a custom tour.... you should! We only had to pay for the parking and our own entrance fees, and you know what? WE thought there was something to see there, and we were glad we insisted on it. 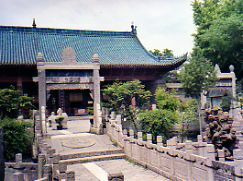 Our guide had told us about another museum -- the Han Yang Ling Museum -- that had just opened which housed another army... one for Western Han Dynasty Emperor Lui Qi. It was on the way to the airport, so we said let's stop and see it. 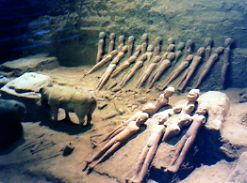 The excavation is ongoing, but it is housed in the museum and under a glass floor so visitors can see the archeologists at work. The soldiers are only two feet tall, rather than life-size. 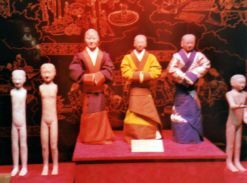 They are clay figures which were originally dressed in silk with wooden arms. Both clothing and limbs have disappeared over the centuries. Exhibits showed what they would have looked like. 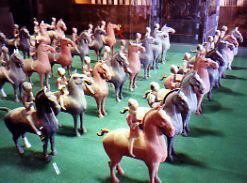 The army was accompanied by herds of animals that they might use or eat.... horses of course, but also cows and goats and sheep and chickens and geese. There were pots and pans and cooking stoves and money.... all represented in amazing detail. 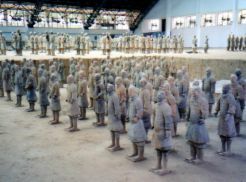 This army may be more diminutive than that at Emperor Qin's Tomb, but it is every bit as impressive, and since we had only heard a little about them, we felt like it was our very own discovery. And though these soldiers were small, they were a big help in making Xian a great little corner of China for us. We had to fly on to the Yangtze to catch our Yangtze River Cruise, that's the beauty of travel... we were leaving Xian a great little corner of China, but you never know what you'll find in the next little corner of the world. When we returned from our trip, we discovered Anna's website, and it really brought back memories. Check it out for more Xian tour tips from Anna. If you want to plan a custom tour to another great little corner of the world go to our Custom Tour Planning List or our Custom Tour Planning page. 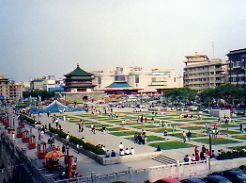 Visit Xian a great little corner of China..., or read about it and dream of a visit in the future..., or check around our pages and dream about whatever great little corner of the world you want to visit. We hope we can help you make your dreams a reality.